Kenya, along with the rest of the world, has struggled to craft a response to tackling violent extremism, especially since militarist groups have been quick to adjust their recruitment methods to adapt to such responses. Widespread narratives seem to suggest that violent extremism has international origins and is inherently a non- Kenyan problem. Yet one of al-Shabaab’s leaders is from Kenya, Kenyan nationals have been recruited into the organization, and extremist attacks continue to take place throughout the country. 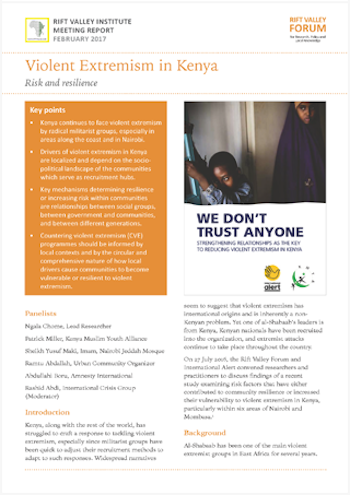 On 27 July 2016, the Rift Valley Forum and International Alert convened researchers and practitioners to discuss findings of a recent study examining risk factors that have either contributed to community resilience or increased their vulnerability to violent extremism in Kenya, particularly within six areas of Nairobi and Mombasa.